“You’re a mad man! I love you! You’re in!” With those words, producer Mel Brooks signed up David Lynch after gawping through his surreal debut odyssey Eraserhead . 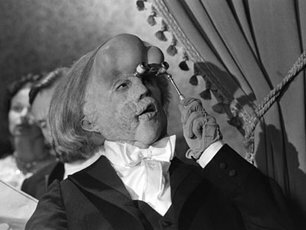 It’s just one of many delightful recollections on the disc’s 24-minute interview with Lynch, whose second film again eyeballs a strange man’s lonely existence in an industrial nightmare-world: John Merrick, aka ‘The Elephant Man’, a grotesquely deformed 20something who went carnival freak-show to one of the most famous men in 19th-century London. Last seen messily C-sectioning in Alien , John Hurt here becomes the monster himself, thanks to an extraordinarily grotesque prosthetic, designed using actual plaster casts of Merrick’s head and limbs. But without a face (buried behind a mass of protruding bone and spongy fungus-skin) or a voice (fighting through wheezes and gurgles), Hurt draws out Merrick’s humanity through the most sensitive gestures and utterances. “There was no need to improvise anything, it was so exquisitely written,” explains Hurt, on his own excellent interview. Delicately probing futile passions and human horrors, Lynch’s most compassionate film until The Straight Story nearly 20 years later sees London surgeon Frederick Treves (Anthony Hopkins, wonderful) trying to restore dignity to Merrick, who timidly reveals a intelligent, gentle soul trapped in the body of an ogre. Oscar nommed eight times, Lynch’s film won nothing – not even for Hammer horror DoP Freddie Francis’s captivating black-and-white cinematography, which turns Victorian London into an underworld of fog and shadow. But inside the cosmic bookends is a fable full of heartbreaking pain and tenderness: Merrick reading Romeo And Juliet to a famous actress, breaking down in tears when Treves’ wife shows him just a glimmer of kindness, being brutalised by his carnival captors and finally choosing to “sleep like a normal man” under the black night’s sky.